Edo Period Early 19th Century Japanese Gold Lacquered Box. 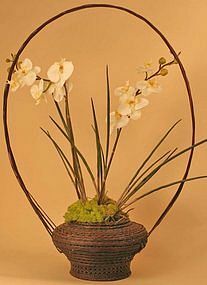 An extraordinary master work inspired by the Rimpa style of Ogata Korin. This stunning box features a pair of Peacocks by a stream with auspicious Flowers and Butterflies rendered in high relief of gold lacquer and accents of mother of pearl. The beautifully rendered auspicious motif continues in the interior of this magnificent work of art. 16 x 12 x 5 inches, 40.5 x 30.5 x 12.5 cm. Excellent Condition. 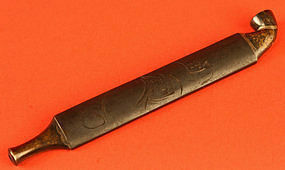 Japanese Edo Period Lead and Silver Tobacco Pipe with Incised Darumas, both the man Daruma Taishi and the god Daruma. Acquired in Tokyo in 1986 by a renowned author on and collector of Asian art. 5 1/8 inches, 13.5 cm long. Fine Large Edo Period Japanese Tobacco Pipe (Kiseru) from the collection of a renowned author on and collector of Asian art. This imposing, oversized pipe of bamboo and bronze with its striking phoenix would have been smoked by a man of prestige, and the effect would have been quite intimidating. Acquired in Kyoto in 1985 by a renowned author on and collector of Asian art. 9 5/8 inches, 24.5 cm long. Very Good Condition. Edo Period Sagemono Tobacco Pipe Set from the collection of a renowned author on and collector of Asian art. 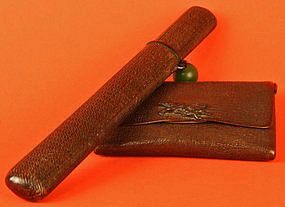 Kiseruzutsu (pipe case) of woven straw; kiseru (pipe) of silver, copper and bamboo with painted decorations; tobacco pouch of leather with a bronze dragon lock and a green glass Ojime (sliding button). Pipe and Case: 8 inches, 20 cm long; Pouch: 5 1/2 x 3 5/8 inches, 14 x 8.25 cm. Excellent Condition. Very Fine and Beautifully Rendered Hono Ema from the Tensho Shrine, dated October 7, 1695. The inscription reads Mikawa Province (modern day eastern Aichi Prefecture), Tomifuku-gun ('county'), Oshiro Mountain. While the wealthy would often give a horse as a gift to a Shinto shrine, the common person would give a Hono Ema (literally 'gift horse picture'). These plaques are then left hanging up at the shrine for the gods to see. This is a rare and museum quality work of Japanese Folk Art from the collection of a renowned author on and collector of Asian art. 23.5 x 16.5 inches, 60 x 42 cm. This rare and exceptional Japanese Mirror Chest of Japanese Ash and Elm with Hand Mirror of fine Persimmon and Gorgeous Brass Metalwork is from the collection of a renowned author on and collector of Asian art. 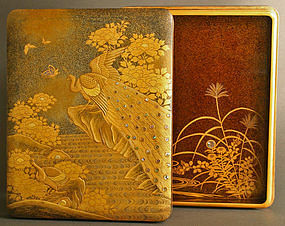 The brass hinges are adorned with Chrysanthemums, the Japanese symbol of health, happiness and well-being. Truly a wonderful and rare piece. 14.25h x 9.75w x 9d inches, 36h x 25w x 23d cm. Excellent Condition. The two fine and old haribako (Japanese Sewing Box) that we offer here on our site are likely the oldest ones you will see offered for sale. 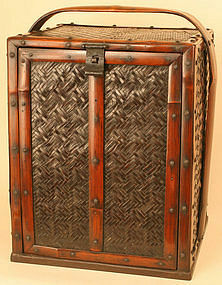 They come from the collection of a renowned author on and collector of Asian art. 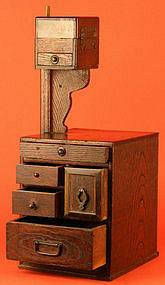 This lovely chest of paulownia and pine has the original hardware, original ruler, and original pincushion. 18.5h x 9d x 7.5w inches, 47h x 23d x 19w cm. Very Good Condition. 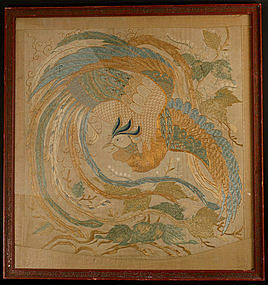 Framed 19th Century Japanese Late Edo Period Embroidery of a Phoenix. Wonderful and elaborate master needle work with beautiful use of soft colored silk threads accented with gold silk threads. This a rare find for the Japanese textile collector. This was part of the Morris collection, which is housed in the Peabody Essex Museum in Massachusetts. It is framed with a Victorian era frame. 26.5 inches (67 cm)w x 25 inches (63.5 cm)h. The textile is in Excellent Condition, the frame is in Very Good Condition. From a prominent and widely exhibited collection. 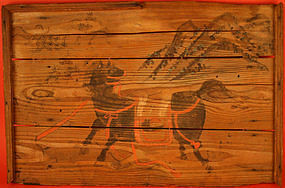 Important pair of very large Late Edo Period (19th Century) Japanese Carved Lacquered Panels. This work of art is of the highest museum quality. Works like these are usefully found in only in major museums and prominent private art collections. We are proud to offer this spectacular masterpiece. 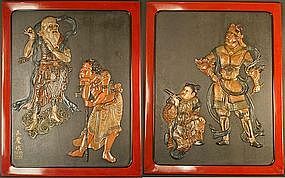 They feature four mythological and historical figures in relief, lacquered in the most amazing techniques. Framed with beautiful red lacquer that is part of the panel. 41.5 inches (105.5 cm)h x 33 inches (84 cm)w. Excellent Condition. From a prominent and widely exhibited collection. 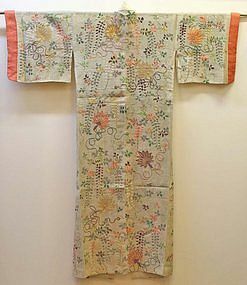 A important Rare 18th Century Noh Theater Robe. This extraordinary silk embroidered example of a summer production Noh Robe has a design of Wisteria, Fans and Ropes, and exquisitely captures the art of Noh. 63.5 inches (161.5cm) height x 52 inches (132 cm) width. Excellent Condition. From a prominent and widely exhibited collection. 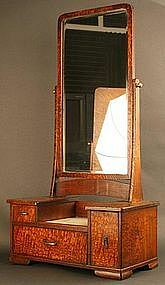 Exceptional 19th Century Kyodai (Japanese Mirror Chest) beautifully constructed of very fine elm root. Japanese artisans ceased use of this expensive wood many years ago. Japanese antique mirror boxes like these are honestly undervalued and underpriced. 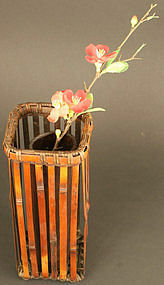 They are the last bargains in the Japanese antique world, relative to their true worth and rare beauty. We strongly suggest buying one now, as we really don't expect this to be the case for too much longer. 31.5 x 16.5 x 9 inches, 80 x 42 x 22.5 cm. Excellent Condition. 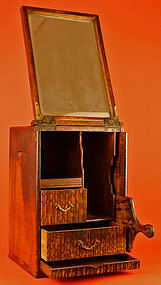 19th Century Kyodai (Japanese Mirror Chests) of this size are rare. 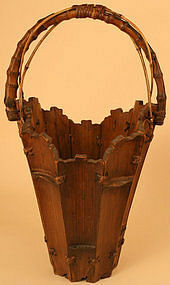 Well constructed of a very fine mulberry and pine. Japanese antique mirror boxes like these are honestly undervalued and underpriced. They are the last bargains in the Japanese antique world, relative to their true worth and rare beauty. We strongly suggest buying one now, as we really don't expect this to be the case for too much longer. 38 x 19 x 10 inches, 96 x 48 x 25 cm. Excellent Condition. 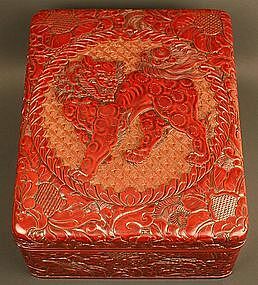 Japanese Kamakurabori Lacquered Box by Kasen, with a design of Peony and Shishi, Buddha's Guardian Protector. Gorgeous rich red lacquer intricately carved in high relief. A superb example that is rare for its size, quality, and superior technique. Meiji Period, circa 1890. 13 inches x (33cm) long x 11 inches (28cm) wide x 6 inches (15cm) deep. From a widely renowned and published collection that has been exhibited at the Metropolitan Museum and Japan Society.